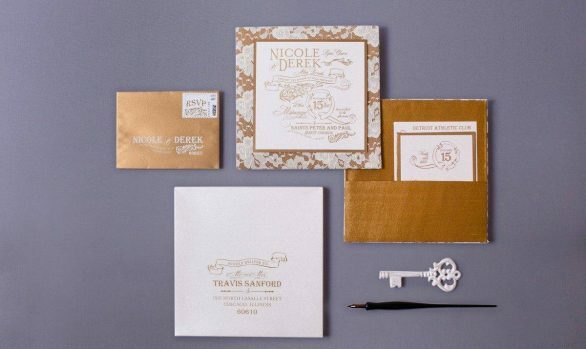 Embossed foil wedding invitations is a gorgeous printing method to give invitations a unique look. The embossed foil was on the custom pocketfold front in the buttons on the pintucking design. A filigree and border were also printed with embossed gold foil on the bilingual invitation. A story about how the couple met was printed on the back of each pocketfold. Custom maps were designed and each guest received personalized entrance tickets for each of the guests in their party. Gold metal appliques were attached to the die cut pocket and all on the die cut seal on the front pocket and seal for the envelope flap. The envelopes were printed with gold foil and were gold tone on tone on the inside of the envelopes.